Morris Jackman donated a copy of this photograph, which shows his father Ernie Jackman working as a baker at Watson's Bakehouse on Howard Street, Great Yarmouth in 1953. 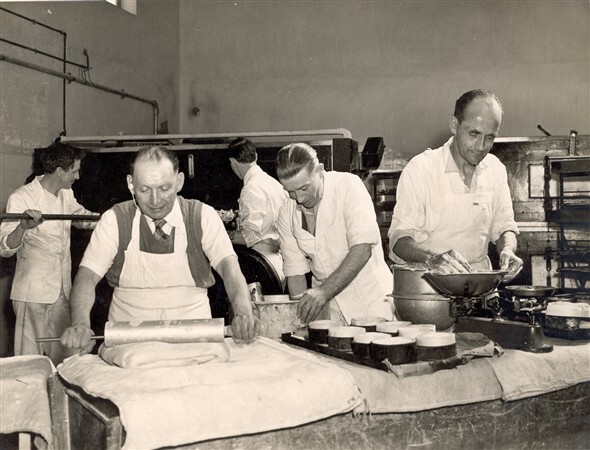 The photograph shows the following people from left to right: Bert Watson (the owner of the bakery), Ernie Jackman (baker) and Edward Vincent other wise known as 'Lollie' (baker). Did you work at Watson's? What was it like? This page was added by Laura Matthews on 14/12/2007. I am currently researching my English ancestors and was so pleased to see this photograph. "Lollie" was my uncle, Edward Reginald Vincent, the brother of my mother, Selina Annie Mancini (formerly Vincent). Lollie was born in 1906 and I last saw him in the late 1940s when I was a young child and he was then living at 1 Walpole Road with my grandparents, William and Elsie Vincent. My uncle, Hubert Hastings, who married Lollie's and my mother's sister and my aunt, Alice Maud Vincent, also worked at Watson's. i worked in Watsons Bakery 1986 straight from Yarmouth High, I remember a few people, Karen in the office, Joyce in the shop. Neil, Aidy, Fred , Reggy, the owner Val Watson and his son Grant,and of course Percy Bowles and Sid Travellyan both now sadly no longer with us my whole working life I owe to the knowledge Sid and Percy gave me, thank you so much you will always be remembered. Matties I. think she means Matthes. They had several shops, the main one being in King St Above this shop was a function room. I can remember the Blue Bus social club hiring it for one of there dances ,probably in 1969. One of the sons of the founder went on to have a ward at the Northgate Hospital named after him, the Herbert Matthes ward. Their main bakehouse was in Englands Lane, Gorleston. Ii think you will find that Grant was Ivy's son ,not Vals and Ivy is Vals sister who also worked in the shop. As far as I know the head baker at Watsons when I was there was Sid Travelleyn, who also worked at Matthes in England Lane. He lived at 9 Bells Rd which used to be the bakery dairy I believe. In the late 40’s one of my every-other-day chores was to run from our Deneside home, cross King’s Street, down the row by Home & Colonial to Watson’s Bakers in Howard Street for a newly baked warm tin loaf. I could never resist tearing off a couple of bites which always tasted boo’iful, and was worth the thick ear!!! In those days just after the war, the shop was dark and dingy (but the smell was heaven) and the ol’ boy serving was covered in flour - although I think his moustache was actually white. And today, purely by chance, I met Morris Jackman - a lovely man who gave a superb presentation on the Lydia Eva Boat where he is a volunteer and whose father, I have just discovered, worked at Watsons. What a small world. Morris and I are the same age and we both attended St Georges, Nelson and GY Tech High schools together. It seems our paths were destined to cross again. Worked there for about 8 yes back in the early 80s remember, joy, Karen, morris, reg, aide, Arthur, Freddy, grant, val of course and Bertie, ray, sid, and others time has made me forget. I am Hubert Hastings & Alice Maud Hastings granddaughter. My mother is Patricia their youngest daughter. I am currently doing our family tree and found that a great great aunt had the middle name of Hubert, not sure why or where this came from as yet.